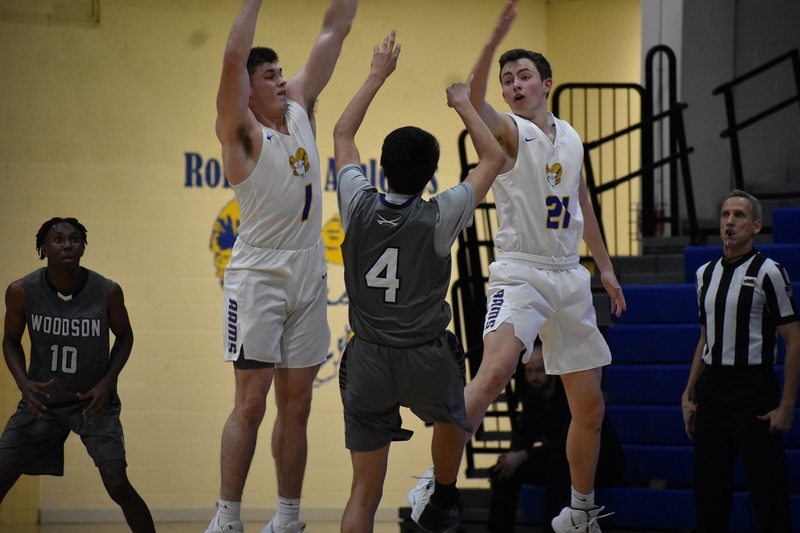 Rams junior Peter Schnizer throws a post entry pass to senior Justin Elkin in the first half of Robinson's victory on Monday. It’s always nice when a program can get a win for its seniors on senior night. 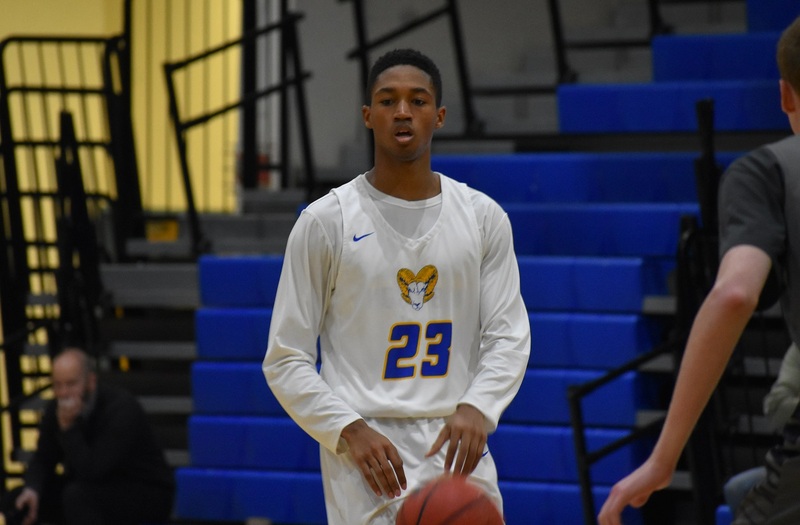 The Robinson Rams did that Monday with a 40-38 victory over Woodson, but their win was important to the program in other ways as well. The Rams hadn’t beaten Woodson in years–last season alone the Cavaliers defeated Robinson three times. In the Patriot District, which is home to the last two state champions, confidence is gained one victory at a time. Monday you could see the Rams’ confidence grow as the game wore on. Danny Checkosky set the tone early with the first points of the game. Checkosky, a reserve not used to playing regular minutes, buried a three-pointer to open the scoring. The Rams struggled to score after that, however, with Woodson’s tall and active defense limiting the Rams to just one more point the entire first quarter. 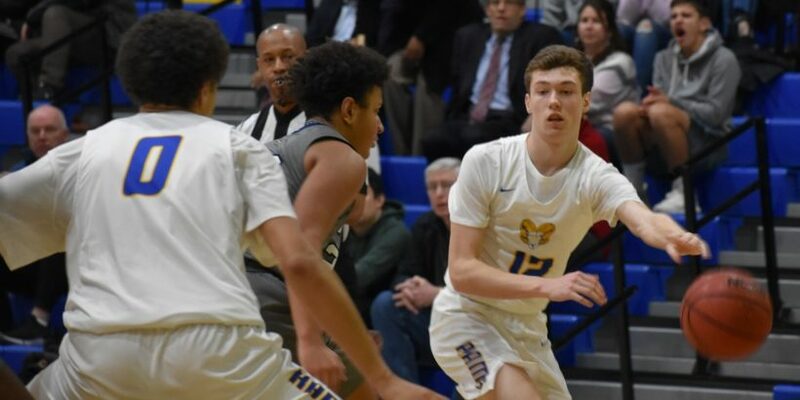 In the second two three-pointers and eight points by senior Drew Pitter powered the Rams offense, but they still trailed 22-16 at intermission. Robinson senior Drew Pitter kept the Rams close in the first half. In the second half the Rams flipped the script entirely. They mixed in some zone and were active on defense, doing a better job limiting the Cavaliers’ tall front line inside. The offense flowed better with senior center Justin Elkin getting more touches. Elkin didn’t score in the first half, but he registered nine points, five boards, and two assists after the break. The Rams’ Tanner LaPlante and Danny Checkosky trap the Cavs’ Joey Lee. An Ethan Rothstein steal and Pitter finish gave the Rams a 40-34 lead with just under three minutes left in the game. Fortunately for the Rams, who missed a bunch of free throws down the stretch, that lead was enough. Woodson had its chances, though. A Chinguun Ganbold lay-up, his first points of the game, cut the lead to 40-38 with 1:13 left. After a Rams missed free throw Ganbold missed a shot, then forward Ben Jensen missed a follow. After another missed free throw Jensen missed a three-pointer and Elkin was fouled. Elkin missed his free throws, but Pitter saved the day with an offensive rebound to end it. It wasn’t the smoothest win but Gildea and the Rams (2-6, 10-9) cared little about that after the game as they celebrated the victory and their seniors with cake. Pitter and Elkin led the way for the Rams, accounting for almost half their offense on the night. Junior Tanner LaPlante was also key for Robinson. The junior guard, normally a starter, had nine points and three assists of the bench, helping to stabilize things before halftime. The Cavs’ Cody Mains (10 points) battles against Justin Elkin (nine points) down low. The up-and-down Cavaliers (3-6, 10-10), state champions two years ago, lost their fourth straight game. 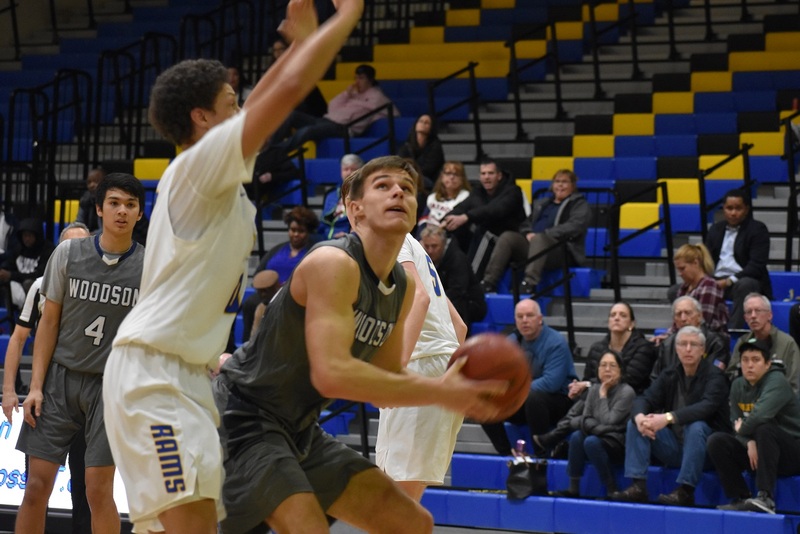 Senior center Cody Mains led the way for Woodson with ten points and eight rebounds. Alexander Anderson added eight points while Jensen and Donovan Boyce each added seven. Both teams are back in action tonight with Robinson battling West Springfield and Woodson taking on Fairfax. Hey Chris out of curiosity. We are ranked in the top 10 in the VISAA1 poll? Do you consider that when you are ranking teams? Thanks for everything you do for the NOVA basketball community. Coach Anthony M Pringle Jr.
Not usually, we make our own choices. But we look at those polls just out of curiousness to see which teams are headed to the VISAA tourneys.